Congratulations to Danielle Hopkins for signing with Cornerstone University. On Friday, November 16, Danielle Hopkins signed her Letter of Intent to play women’s basketball at Cornerstone University. Danielle plans to study Exercise Science and has applied for the Honors Program at Cornerstone. When asked why she wanted to be a Golden Eagle at Cornerstone Danielle stated, “I really enjoyed the girls on the basketball team and students I met on my visit. The atmosphere at Cornerstone is amazing, and I really love the Christ-centered education. I hope to grow in my faith as a person and as an athlete.” OCS New head coach Dennis Hopkins stated, “We are excited for Danielle to have the opportunity to play at the next level at Cornerstone University. She could not have picked a better place for her to grow as a person and a player. 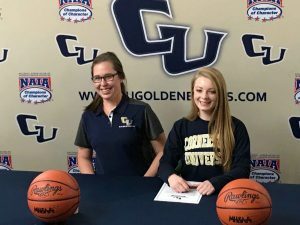 We look forward to seeing her play and contribute to the future success of the Golden Eagles program.” Danielle currently holds the record for the most made 3-point field goals in a season, and entering into her senior season Danielle already holds the career mark for 3-point field goals made in a career for Oakland Christian. Oakland Christian wishes Danielle all the best this senior season at OCS and then next year as a Golden Eagle at Cornerstone University.